CHICAGO – Reed Construction is pleased to announce that the firm has completed a 375,000 square foot renovation for Aon Corporation at The Aon Center in Chicago. 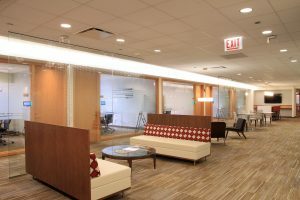 Located at 200 E. Randolph, Aon is the leading global provider of risk management services, insurance and reinsurance brokerage, and human resource consulting and outsourcing. Reed Construction was selected to complete 13 floors of renovations including conference room updates with new aluminum and glass office fronts, the addition of new break rooms on 12 floors, and new reception desks. Reed Construction also renovated 19 private meeting rooms, 13 private offices and four pantries. The building now features millwork door frames and sidelites, marble floor tile for the third floor elevator lobby and reception area, along with new paint and carpet throughout. Bryan Krueger was the Executive Vice President involved and Steve Sandquist was the Project Manager for Reed Construction. IA Interior Architects provided the architectural services.